Last Friday, it was revealed that the Iranian UAV which infiltrated Israel’s territory on February 10th, 2018 carried explosives and that its mission was to perform an attack in Israel’s territory. This information was based on flight route analysis and operational intelligence research performed on the UAV. The interception of the Iranian UAV by an IAF "Saraf" (AH-64D Apache Longbow) attack helicopter prevented the attack and an Iranian attempt to perform a military action in Israel’s territory. It is noted that the Iranian aircraft was detected in the IAF/IDF’s defense systems and traced until its interception. It did not pose a danger during its flight in Israel’s territory. The helicopter was piloted by Lt. Col. L', Commander of the 113th ("Hornet") Squadron based in Ramon AFB. 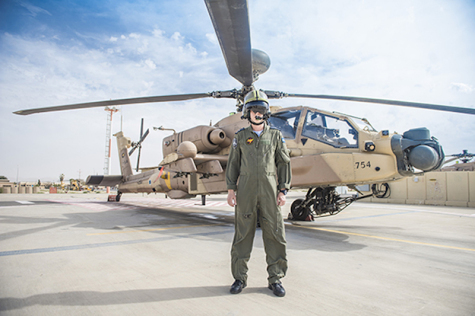 In a special interview for the IAF Site, Lt. Col. L' tells all about the operation. "Tell us when the target has crossed the line", the air traffic controller said to the pilot. "It's crossed. I need your help", answered the pilot. "You are allowed to engage", confirmed the controller. The pilot replied: "Positive result on the target. It has exploded in the air". "We were in communication with the control center when the UAV was detected. I realized what and where it was and managed to make contact as soon as it got closer". "I made eye contact before it even entered Israel's territory", added Lt. Col. L'. "When it neared the border, we understood that it was indeed a UAV. We waited for it to cross the border. I was in communication with the IAF's Command Center in attempts to estimate where it would fall. As soon as it crossed the border, I was permitted to intercept". For the first time ever, the IAF intercepted an Iranian UAV which infiltrated Israel’s territory. The challenging, low-signature UAV was intercepted during nighttime, in motion in a clouded sky. “The squadron performed the mission as well as possible”, declared Lt. Col. L’. “We will not allow our aerial sovereignty and Israel’s sovereignty to be violated. A UAV such as this one can reach far into Israel and collect data, or even explode in Israel’s territory. It was important for us to perform the mission in its entirety - prevent the enemy from invading our territory and then using fighter aircraft to attack the Iranian control station”. 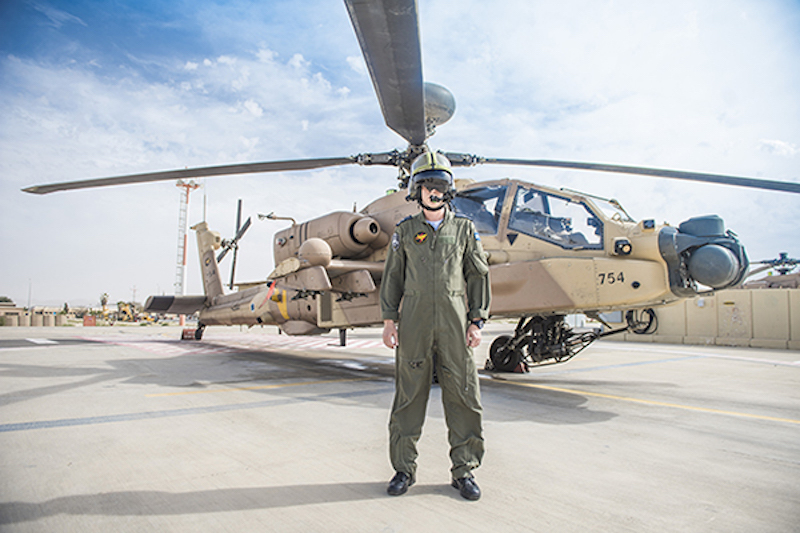 When Lt. Col. L’ was asked why the IAF chose the helicopter division for the mission, he replied: “The attack helicopter division has a variety of capabilities, such as detection and reconnaissance. The ‘Saraf’ helicopter can detect the target and transfer data in real-time”. Lt. Col. L' elaborated: “We came prepared and operated according to the operational orders. I received constant updates regarding the target’s location from the controllers in the IAF Headquarters. The conduct was very professional, both in the squadron and in the cockpit. Procedures went only as planned. We felt good after the attack because we knew that the mission was operated well. One of our missions is defending Israel’s skies, with an emphasis on the northern theatre”. “Our work didn’t end after the Iranian UAV interception”, revealed Lt. Col. L’. “We had a mission to follow the UAV's wreckage until it reaches the ground in order to ensure that there are no civilian casualties”. Lt. Col. L’s crew directed the “Yanshuf” (Blackhawk) helicopter in collection of the UAV's wreckage. “It was important to collect the wreckage quickly so that we could understand the type of UAV and whether or not it carried explosives”. Later on, a large-scale attack was performed targeting Syrian aerial defense systems as well as Iranian targets in Syria. “My helicopter crew had just returned from the interception mission. As squadron commander, I had to prepare my squadron for combat”, described Lt. Col. L’. “We armed our helicopters, briefed everyone and began preparing for more operational activity. The squadron is prepared for any occasion in any theatre”.